← Do the Dutch create ‘shared use’ pavements like us? I noticed this gem over the weekend on Twitter (thanks to Kats Dekker). It’s a quote from the forefather of Vehicular Cycling, John Forester. I think it is now common knowledge that Forester – despite being so absurdly influential in cycling policy for a considerable period of time – is completely clueless about Dutch practice. This cluelessness is partly due to blatant prejudice, but also because he’s never even taken a look for himself. Anyone who has visited the Netherlands would know that you are never suffer ‘delays’ while cycling, let alone ‘long delays’; nor is ‘slow speed’ an intrinsic quality of the Dutch system. Forester has just assumed that to be the case, without any evidence. Nevertheless the idea that Dutch tracks are for ‘pootling’, or for ‘slow cyclists’, is remarkably persistent among a good number of prominent UK cycling advocates, particularly many who should know better. In the Netherlands, according to these individuals, you apparently have to cycle slowly everywhere; if you’re a ‘fast’ cyclist, woe betide you if you get stuck behind a granny, or some schoolchildren. You’ll be stuck! Richard Lewis of the London Cycling Campaign is just one person who seems to think this, although there are many others like him. You are a lot more like a vehicular cyclist in Denmark than you are in the Netherlands, where you are much more of a pootling cyclist. The Dutch stuff encourages slower cycling – which some people say is more civilised, and perhaps under certain circumstances it is. Well, without wishing to be rude, I have to say this is nonsense; as wrong as Forester’s silly notions about Dutch infrastructure. Ironically, the very fact that fast moped riders sometimes illegally use the bicycle path, because they prefer it over the main road, even though they should be riding on the carriageway, is in itself an indication of the quality of this separated bicycle infrastructure. Starting with city centres, here are videos of tracks in the centre of Rotterdam, Amsterdam and Utrecht. (For reference – given that this is now a hot topic in London – note that the Utrecht track passes behind a bus stop). These are busy locations, but it’s not really valid to claim that you are ‘impeded’ cycling here. It’s perfectly possible to pass other cyclists using the full width of the track. Even if you are delayed, it would be only momentary; it bears no comparison with the typical delays you will encounter cycling amongst heavy motor traffic. Note that this cycle track serves as a service road for vehicles accessing side streets, and parking bays. It’s wide and smooth enough for that purpose. Note also that, just as in the Utrecht example, it passes behind bus stops, meaning that you can cycle free from the stress of having to overtake – and be overtaken by – buses. It’s very civilised, and pedestrians and cyclists interact calmly. The system works beautifully. Two-way cycle tracks are common in many locations in the Netherlands. Typically they will be found alongside larger roads, and with restricted access to and from side roads, to minimise conflict. This one is in the centre of Assen. Very easy to cycle fast on this track, and to pass people who might be cycling slower than you. The same is true of two-way tracks in the suburbs of Assen – this one connects the new, large development at Klosterveen with the city itself. And another two-way track in Assen. No hold ups. (The video also shows how motor traffic is held while cyclists have their own green signal on the junction, something I touched upon in this earlier post). On a one-way track nearby, I find myself cycling behind a mother and her daughter, cycling side by side; perhaps the greatest fear of those who wish to cycle fast. As the video explains, it is actually very simple to pass people cycling side by side like this in the Netherlands. A simple ring of the bell, and those ahead of you will move over to allow you to pass. I choose not to do so in this case as there’s no need; we’re making good progress, and I am part of a group. Here’s a video of a similar track in Groningen, albeit without car parking. Very easy to cycle fast, and to overtake others, as the scooter riders demonstrate. Suburban tracks in the Netherlands typically look like small roads. They are as wide as, if not wider than, a conventional UK country lane, but for the exclusive use of cyclists and pedestrians. Here are some examples. There is no way on earth you would ever be ‘held up’ on a cycle track this wide. Finally, while I have been describing the process of cycling on Dutch tracks and paths themselves, it is very important to stress that you aren’t ‘held up’ at junctions either. While making left turns (the equivalent of a right turn in the UK) will often have to be made in two stages, the light sequence will usually be designed in your favour, so that second leg comes quickly. Conversely, right turns – the equivalent of a left turn in this country – are always possible, no matter what is happening on the junction itself. That is because cycle tracks typically bypass signal controls when it is not necessary to stop bicycles. Mark Wagenbuur has an excellent post detailing these designs; here’s just one small example from Amsterdam. I suspect the reason why the assumption that Dutch cycle tracks are for ‘slow’ cycling is so persistent is because of a category mistake. ‘Fast’ UK cyclists look at the Dutch experience and see plenty of people cycling slowly, in the way they want to – the type of people who are very rarely seen cycling on Britain’s roads. They then assume that Dutch paths are ‘for’ this type of slow cycling. Forester makes a version of this mistake; that because Dutch cycle paths allow for ‘incompetent’ cycling, so this must be the only kind cycling possible on them. But this isn’t true at all. Dutch cycle tracks are for everyone; the mere fact that they attract plenty of ordinary people is a virtue of their inclusiveness, not a fault of their design. They are safe and attractive, and fast and direct. This is a message that David Hembrow has been communicating – or attempting to communicate – for years. I wish it would start to sink in. This entry was posted in Infrastructure, Modal share, Safety, Subjective safety, The Netherlands. Bookmark the permalink. Those VC advocates think they go faster when “taking the lane”. Sure, from one traffic light to another and then stand still next to the cars with whom they compete. Or behind them , inhaling these wonderful and healthy fumes coming from the trucks and buses. So much better than a infrastructure where the traffic lights are green for YOU. What’s wrong with pootling, anyway? New systems should be about increasing safety, and getting more people on bikes, not pandering to the speed demons. I suppose my point is addressed more at the claim that Dutch cycling is ‘slow’; specifically slower than cycling in the road. There is a widespread belief in the UK that putting in this kind of infrastructure involves sacrificing journey time for the sake of improving the quality of the cycling experience. This isn’t true, of course. No, not that argument, please ! Nothing wrong with pootling for those who want to pootle. It’s a free world, after all. However, if I’m in a hurry I don’t want to have to pootle. Luckily, as Mark has explained well above, there is no need to pootle in the Netherlands. You can see see posts explaining that on my blog, with several examples of cycling fast. I found that I could commute significantly faster on cycle-paths in the Netherlands than was possible over a shorter distance on roads in the UK. The primary reason was that I didn’t have to keep stopping here. I think it’s about understanding the purpose of your journey. If it’s to get from a to b then it isn’t a race. There’s little to be gained by getting past the next cyclist just for the sake of it. That’s boy racer behaviour. Of course you might be running late and want to get from a to b in a hurry. But it seems that the dedicated cycle infrastructure improves the odds of a quicker overall journey anyway. And running late is bad enough without the additional impact on one’s blood pressure of worrying about being run over by a lorry. To add to this discussion about “pootling” I’d say that the word can mean different things to different people. As far as I’m concerned, most Dutch people make good progress when riding a bike – as you’d expect, because they’re usually doing it for transport, not leisure, of course. I’m sure that a professional racing cyclist would see it differently. Forester often describes the Dutch as doing ‘pedestrian cycling’ or ‘riding at pedestrian speeds’ which is not only untrue, but almost impossible – it’s difficult to ride a bike at walking pace without falling off! The average Dutch cycling speed is obviously many times faster than walking. I’d estimate a Dutch cruising speed to be around 10 miles per hour, but that really is just an anecdotal estimate. Does that sound about right? Finally, to quote Parimal Kumar on Twitter today, a message I would address to either of the two Johns or their acolytes: “If you’re opposed to this type of infra then you’re against mass cycling” – it’s as simple as that. 10mph sounds about right, it’s about the same effort cycling at this speed as it is for normal walking. Of course the thing that has the biggest impact on urban journey times (average speed for a journey) is not the top speed you reach but minimising the time spent stopped. This is why cycling is consistently as fast as, or faster than, driving in congested cities. The average speed of cars in London is just 9.7mph, even though they reach top speeds of 30mph. Not having to stop is also very beneficial for cyclists because getting going again requires significantly more effort than cruising at 10mph. Motor vehicles and people on bicycles have very different needs, and they do not mix well at all. Two comments: first, I recall reading something by John Franklin where he described the situation where Dutch cycle tourists arriving at Channel ports were reduced to quivering wrecks as soon as they tried to cycle on British roads. He expressed the hope that we wouldn’t drop down to Dutch standards of cycling skill. But what had struck me as a British cyclist who went to live in the Hague for three years was how incredibly skilled the Dutch were as cyclists. They had in particular one skill I lacked – the skill of cycling with a mass of other cyclists. I had to learn a lot. Franklin and others mistakenly think that cycling skill is largely about cycling with motor vehicles. In Dutch towns that is only part of it. The Dutch are multi-skilled cyclists and put us to shame. Somehow Franklin et al just don’t understand this, yet they are considered ‘experts’! However, my second comment is that one should not overegg the pudding. My experience is that urban cycling speeds in the ‘Ranstad’ (the ring of cities including Amsterdam, Rotterdam, Utrecht, etc), especially during rush hours are necessarily those of the mass. There isn’t room for 20mph vehicular cycling on Dutch urban cycle networks – but that is a good thing as fast urban cycling is selfish. I remember reading exactly the same comment from Franklin and being equally bemused by it. After a cycling holiday in the Netherlands when we still lived in the UK, Judy and I once met a Dutch couple on the ferry who we fell into conversation with. They had cycled with their two small children on their own bikes from somewhere near Amsterdam and their intention was to cycle to Stonehenge. We were shocked and tried to explain that they may well have to change their holiday plans. While it’s possible for children to cycle safely from Amsterdam to Hoek van Holland, there’s no rational route to take from Harwich to Stonehenge. However, the tourist information they’d received from the UK said it was fine cycling country and they were determined to try it. After a couple of beers we said goodnight. The next morning we last saw them standing at the side of the road next to this roundabout on the A120 in Harwich. Our view of this family was from a car window. While we were keen cyclists and I’ve cycled several times between Harwich and Cambridge before, we also knew that it was much more pleasant to cycle in the Netherlands so we’d done all our cycling there for our holiday. I hope the family turned around and took the next ferry back to the Netherlands. I really do. It’s not because they were incompetent, but because they’d been lied to by the tourist information from the UK. I agree on your point about the skill of cycling in a mass. This is something which I often have to point out to visitors because a lack of familiarity with this even amongst experienced cyclists from the UK or USA leads them to stop and stand in the middle of cycle path, or to dawdle along holding up the Dutch by riding several abreast completely oblivious to the traffic jam that they are creating. It’s quite interesting to see. As for speeds in town, I agree you largely have to cycle at the speed of the mass. This isn’t as slow as many people from outside think it is anyway. However, I’ve found it quite reasonable to expect to cover ground at higher speeds than 20 mph over longer distances starting just outside of town. Well, I can cycle 20 mph in NL. Only when I enter city center (dead center that is) during the high tides of rush hour, I can expect to be slowed down to 20 kmph, for the last (or first) mile. My average speed on my commute has been 24 kmph for the last 15 months, and I work normal office hours. In a UK context it typically is, and that’s the context Cyclecraft is written for/in. If you can’t mix it with traffic you can end up a lot worse than “delayed”. A lot of people /won’t/ mix it with typical UK traffic, and I can’t say I really blame them, so leaving cycling for enthusiasts who are forced to be “vehicular” if they want to get anywhere much. Franklin’s work deals with coping what we have, and what we have generally benefits from the sort of techniques outlined in Cyclecraft. I wish it were otherwise, but I’ll use them if the alternative is sitting at home wishing it was like NL. If books like Cyclecraft and Effective Cycling were written and understood as guides to how to cope with a hostile environment and still ride your bike, then they’d be great. 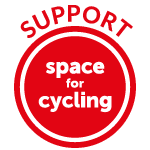 But they’re written – and have provided plenty of political cover – to encourage the building of environments that are hostile to cycling, and actively oppose anything better, which is unfortunate. I used to like to cycle everywhere as fast as I could, overtaking everyone on the cycle path and getting anoyed if obstructed. I believe this stemmed from several reasons: stress, being used to cycle 13kms each way to school in my youth, and impatience. But luckily with the years a more relaxed attitude has set in, and I surprised myself the other day by finding out that I enjoyed cycling at a much slower pace so much. For one thing, singing while riding (which is to be recommended) goes a lot better, I saw a lot more of my surroundings and most of all I enjoyed the cold weather. Pootling along does sometimes have its advantages, but I would say it’s complementary to fast cycling, not better, nor inferior, and certainly not only for the incompetent, the old and the infirm. Ironically the kinds of cyclists not welcomed on Dutch roads are anti social, cut you up, race you to the next set of lights cyclists like what can commonly be found in London. Or the courier style whizz about where you like variety. Pootling is deceptively fast in the NL on a roadster, especially with a tail wind. There are lots of opportunity to travel tens of kilometres along canals and dual carriageways between towns, on wide two way roads away from motorised traffic. The Dutch love their road bikes and the roads are smooth too! From a club cyclists point of view, I would say that the people in these clips are probably going far far quicker than we could ever travel in our towns. We gather on a Sunday morning and we roll through town to the lovely Cheshire countryside at about 12 mph. Two lines of frantic BELOW! STOPPING! LEFT! BELOW! We simply cant cycle fast as the roads are in such a bad state and we constantly have to stop for traffic lights. From my trip there last year i’d say that in the centre of towns or at peak time the max speed you cycle in holland is a fai bit lower BUT this is MORE than made up for by the fact the lanes flow so well through towns and suburban areas. So a really good average speed is possible.. which is surely the aim. Great post Mark. People raising this issue often seem to be confusing ‘top speed’ and ‘average speed’. It might be harder to cycle at a 30mph sprint on a typical urban Dutch bike lane, partly because you’re likely to be sharing it with a bunch of other cyclists, but the other characteristics of the network you describe – continuous links and fewer stops, mainly – mean that your average speed may still be higher. Forester et al are over-rating the importance of the ‘skill’ of sharp acceleration which is necessary to stay alive in UK urban conditions. And anyway, if Dutch cycling was as slow and unpleasant as Forester seems to think it is, why does he think so many people do it? Champagne cyclists can cycle on the road if they want!!!!!!!!!!!!!! Over the past couple of days, now the schools are back, there has been a massive jam of motor vehicles from one end of Weybridge to the other. Cyclists breeze past all this and the vast majority are not practising Cyclecraft – they don’t need to, given the gridlock ;-). Indeed, a significant number “pootle” along the footway, some being parents escorting children to school. So whether Dutch cycle paths are slow or not they are clearly faster than the way most people are travelling in the UK ‘burbs at rush hour. Unless motor vehicles are taken off the road, this situation will persist, and in places like Weybridge you’ll only achieve that by giving people inviting cycling infrastructure so that they cycle instead of drive. When all is said and done though, Cyclecraft was first published by the Stationery Office in 1997 – over 15 years ago so it doesn’t seem to have made much an impact on cyclist numbers. Anyway, more examples. The fastest I’ve ever been on a bike on the flat was tagging onto the back of a club run (with their permission) after they overtook on the Morerkapellepad between Gouda and Zoetermeer a few hundred metres west of here: http://goo.gl/maps/ke5jy. And on my commute through Den Haag, if I wanted to speed, I used to go up and down here (http://goo.gl/maps/QG4Y1) at a decent lick because it was relatively quiet, turning back into town and more busy roads when I got near to the seafront at Scheveningen. Otherwise, it was straight through the centre, much as kruidig meisje describes, which with infra like this: http://goo.gl/maps/bPKhQ, was a breeze. And almost completely stress free, unlike, say, my former commute in London (Sutton to the City). I got shooed off a Dutch cycle path because they were using it for racing, so it’s not just for slow ones! It’s funny how some cyclists make a show of being fast and wearing all that ridiculous costume – obviously very paranoid about being slow & probably the ones complaining about this. They should realise the speed of a cyclist is mainly to do with the legs, not the colour of the tarmac. The fact is that with traffic lights etc, there is very little difference in journey time across London for slow and fast cyclists already, although in other locations I’m sure it’s different. But when the lights go green it turns out some cyclists aren’t as fast as they think they are! I love your suggestion that some people are afraid they might end up cycling behind a mother and daughter too. I wonder if part of the problem in the UK is that rather than a “cycling” culture, we have a “cyclists” culture? If we provide all the infrastructure to get all and sundry on bikes, the people who spend a fortune on kit and carbon fibre will realise that actually, cycling is reasonably cheap and easy and you could pick up a second hand Dutch bike for less than the price of the Raffa merino wool ear muffs Cycling Plus told you you absolutely needed to commute in. For Gods sake, keep the kiddies in cars, it justifies my Barclaycard bill! Was touring in NL for 2 weeks last summer, sharing the Fietspads through the dunes with a very large number of sporting cyclists (it was during Le Tour) out for their hacks. We were going slowly, they certainly weren’t! The big difference with the Dutch is the law that protects cyclists. I have ridden there and its safe but drivers tell me if you drive like you are still in the Anglosphere and disregard the cyclists you get in trouble. All the safe cycling countries have laws that require some deferentiality around bikes. These laws dont exist in the UK, the USA, or Australia. By the way, they rode pretty fast to my thinking, even on the bike trails. The law that you refer to is a European Union wide law and also applies in Denmark, and has done so for years, yet it does not protect cyclists. Today, there is a cyclist light at that part of the junction too and it is visible in the link, but that was only put there after she died. The reason it was not set up at the same time as the light in the 1st picture was that most trucks go straight on. This death could have been avoided with Dutch style infrastructure, rather than a law that was already in place at the time of the accident. I love The Netherlands and its bikeways! Such a small country but with such nice places to visit. Any of you know any good bike tour companies which organize holidays in Holland? I found http://www.hollandcycletours.com and http://www.eurobike.at/en but nothing spectacular so far. Any help? ?